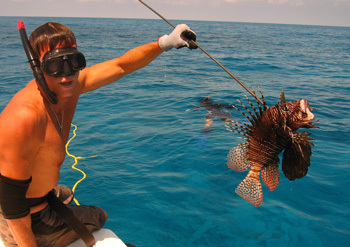 Welcome to the Lionfish Derby and Rodeo site! The non-native Indo-Pacific lionfish has no predators in the Atlantic ocean and is wreaking havoc on our reefs by explosively reproducing and eating dangerously high numbers of important, native species such as juvenile grouper, snapper, parrotfish, grunts and crustaceans. Our objective is to raise awareness and help control local lionfish populations by holding competitions to capture lionfish and put them on the menu. They are delicious to eat. We must become their predator! Watch Scourge of the Lionfish on PBS. See more from Saving the Ocean.